Father Edward Prendergast came from Monasterevin. He became Parish Priest in 1749 in Salamanca in Spain. Fr. Prendergast celebrated mass in secret places. He was arrested while saying mass, captured and brought to Monasterevin House for trial. 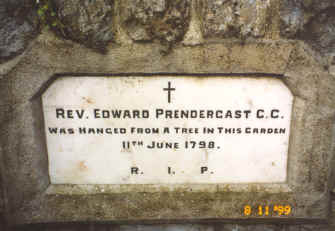 He was later brought across the road to the garden and hanged from a tree. On June 11th. 1798, soldiers guarding his body were given drink. They fell asleep and the body of Father Prendergast was taken down by the people who loved him. He is buried in Harristown.